Recent studies have shown the feasibility of burning higher actinides (i.e., transuranium (TRU) elements excluding plutonium) in ad hoc designed reactors (Actinide Burner Reactors: ABR) which; because of their hard neutron spectra, enhance the fission of TRU. 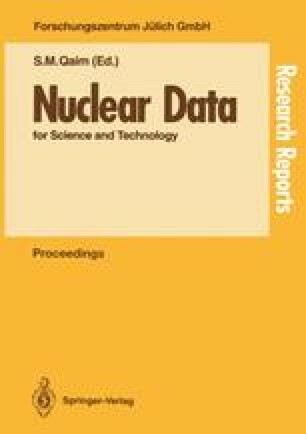 The transmutation of long-lived radionuclides into stable or short-lived isotopes reduces considerably the burden of handling high-level waste from either LWR or Fast Breeder Reactors (FBR) fuels. Because of the large concentrations of higher actinides in these novel reactor designs the Doppler effect due to TRU materials is the most important temperature coefficient from the point of view of reactor safety. Here we report calculations of energy group-averaged capture and fission cross sections as function of temperature and dilution for higher actinides in the resolved and unresolved resonance regions. The calculations were done with the codes SAMMY in the resolved region and URR in the unresolved regions and compared with an independent calculation.